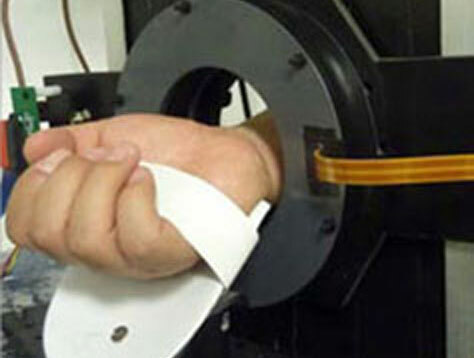 A compact, non-invasive PET Scanner that circles the wrist or ankle; it determines the arterial input function essential for quantitative PET. The Arterial PET Scanner is in continuing development. In the future provide improved diagnoses in clinical treatment; it is currently being used for investigative purposes in therapeutic validation. The results for the input function should compare favorably to the Standard Uptake Value (SUV model). The Arterial PET Scanner is designed to determine the input function essential for truly quantitative PET. Conventionally, the Standard Uptake Value (SUV)—a semi quantitative analysis–is used to determine the amount of radio tracer observed by a Positron Emission Tomographic scan (PET Scan) and is commonly used in flourodeoxygluse (FDG) imaging (often with FDG 18). Certainly, this quantification is extremely valuable (ref: http://jnm.snmjournals.org/content/45/9/1431.full). The Arterial PET Scanner is non-invasive and eliminates the need for an arterial catheter. 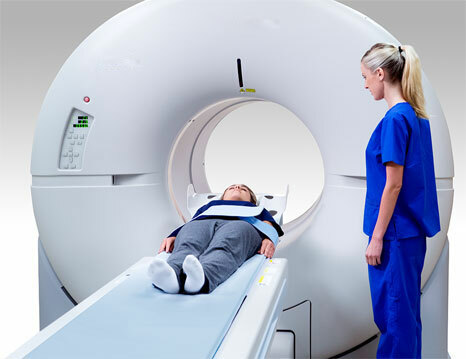 The goal of the Arterial PET Scanner is to provide improved diagnosis in clinical treatment; and is currently being used for investigative purposes in therapeutic validation. The results of the Arterial PET Scanner should deliver data “at least as good as” or surpassing that of the SUV model. The development of PET radiopharmaceuticals and drug discovery that incorporates PET imaging should be greatly advanced with the utilization of the Arterial Scanner.